It is important for commercial establishments, such as restaurants, to remain pest-free for health and sanitation reasons. The most problematic pests in restaurant settings include rodents, German roaches and flies. Not only do these pests evoke the “ick” factor, but they can contaminate food and spread disease. AmeriGuard Pest Defense provides different options for commercial pest control services. The Riverside County Department of Health has some good tips for preventing restaurant pest control problems in this “Food Handler’s Manual“. Contact a licensed pest control company, such as AmeriGuard Pest Defense, to treat your pest problem quickly and efficiently instead of trying to do it on your own. Often times, over-the-counter products at your local hardware store are not labeled for use around food environments. These products may also only serve to repel the insects and provide a false promise of pest elimination, only to wear off later with the pests having built up their population, thus returning with a vengeance. Trying to take care of the infestation on your own may only prolong the problem and negatively affect your business. 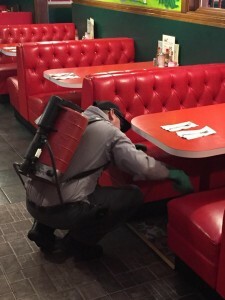 In the below case study, AmeriGuard Pest Defense received a call from the manager of a restaurant business that recently purchased some seating booths with an unexpected pest issue. AmeriGuard Pest Defense was contacted for an early morning commercial pest control service. This account was also put on a Monthly Commercial Pest Control Service to ensure year-round control and maintenance. This option gives peace of mind to the restaurant owner and staff knowing that their investment is protected from unwanted pests and negative grades from the health department. Pest Control Technician, Nic Shafer, treats inside of restaurant account in early morning to eliminate pest control issues.